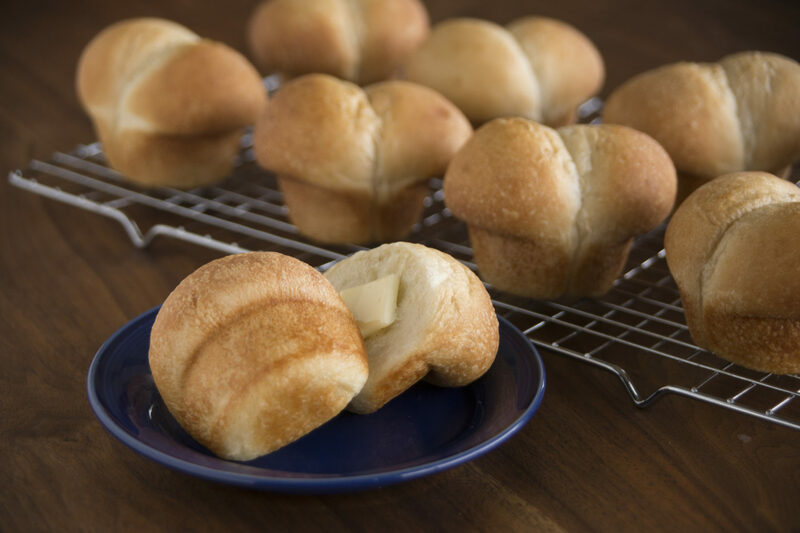 With some butter you can make a fancy roll like this one without even trying. Place two rolls in each cup of a sprayed 12 cup muffin tin, flat sides together. Squeeze, spray or brush butter or margarine between rolls. Remove wrap and bake at 350°F 15-20 minutes. Immediately remove rolls from pan and place on cooling rack. For my timing purposes…about how long does it take for the balls to rise in the muffin tin before baking? It is difficult to give you an exact time. The time it takes for the dough to rise, depends on the warmth of your kitchen and the freshness of the yeast. I would say approximately 1-2 hours, depending on those factors. It takes 2 – 21/2 hours in my oven on (85 F) proof. They are a double dough ball and take longer then 1 hour to proof. I top my buns with more butter and flake sea salt when they come out of the oven. Yummy! I use to make by scratch, but Rhodes are just as good without the hassle. P.S. – I make mine from frozen dough. I mAKE MY BREAKFAST PULL APART FROM YOUR DINNER ROLLS. I DON’T HAVE A BUNDT PAN SO I USE AN ANGEL FOOD CAKE PAN THAT DOESN’T COME APART. i AM HAVING TROUBLE TELLING WHEN THEY ARE DONE. THE TOPS ARE BROWN AND A BIT CRUSTY BUT WHEN I PULL THEM APART THEY ARE DOUGHY IN THE MIDDLE. i BAKE THEM @350 FOR 30 MINUTES AS THE RECIPE CALLS FOR. SO HOW CAN I TELL WHEN THEY ARE DONE? aLSO IS THERE ANY WAY TO KEEP MY NICE BROWN SUGAR SAUCE FROM GETTING ON THE BOTTOM AND GETTING TOO CRUSTY TO PUT ON ROLLS. THANK YOU FOR YOUR HELP. 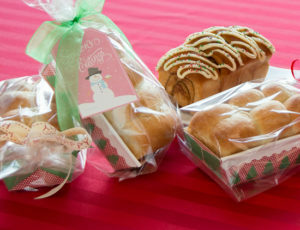 i HAVE BEEN USING YOUR ROLLS FOR 20 YEARS AND MY FRIENDS AND FAMILY ALL LOVE THEM. I just spoke with our demonstrator and she gave me some good ideas to pass along to you. She suggest investing in a good bundt pan. She says to buy a good heavy Bundt brand pan which is a 12 cup size. Mostly because an angel food cake pan requires more dough than what we suggest. Spray your pan well and then she layers half the rolls which are rolled in the pudding mix then half the pecans and half the brown sugar. (She doesn’t make the syrup, just the brown sugar.) Then do the other half rolls the same way and finish with the remaining pudding mix and the 1/2 cup melted butter to pour on top. Bake at 350 for 17 minutes and cover with aluminum foil. Then bake for 17 minutes more. I hope I haven’t mixed you up. But if I did please call me at 1-800-876-7333.